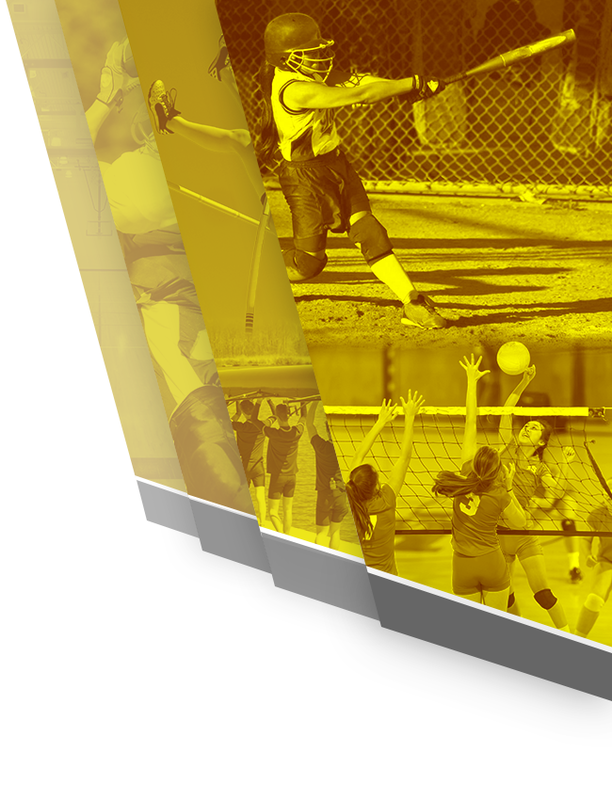 Click Above to Link to the New Cheer Website! 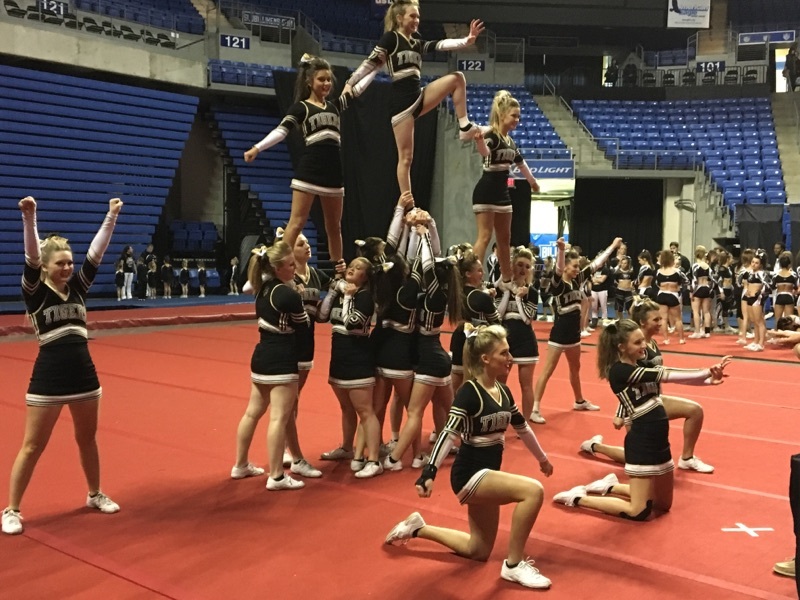 Varsity Cheer performed at the Missouri Cheer and Dance Association’s Missouri Winter Games Regional Competition in Springfield, Missouri March 3rd. 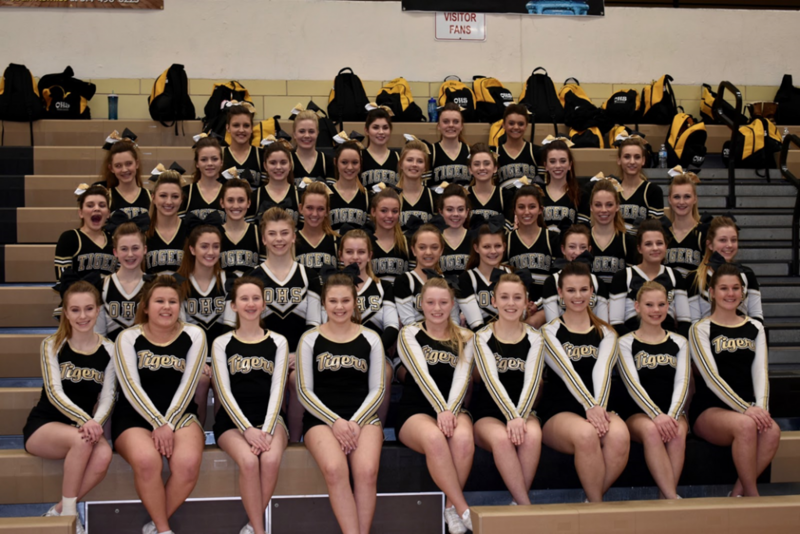 Due to an absence of other high school teams at the event, Oakville decided to compete in the more difficult, all-star division, against five other all- star gyms. This division focuses on more elite stunting, tumbling and performance quality. 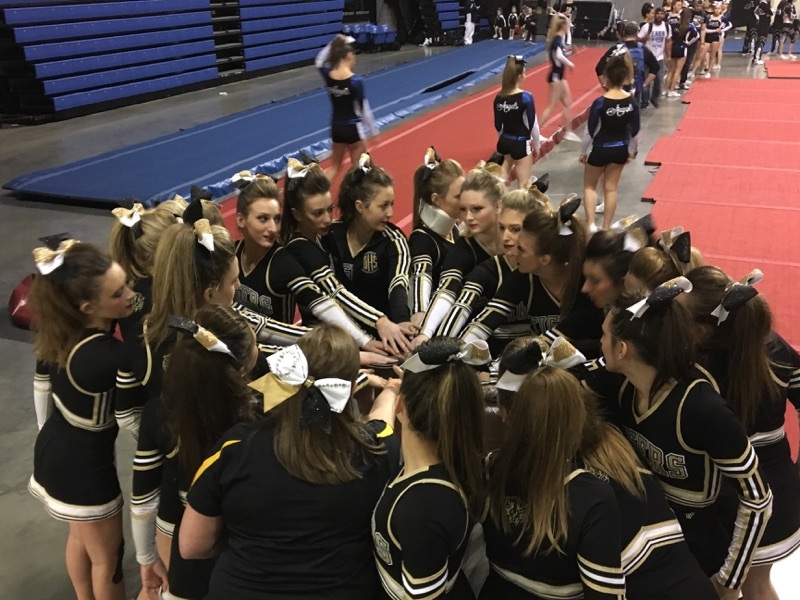 After working since October on their competition routine, and a disappointing “ice day” canceling a previously scheduled competition in February, the team was excited, and ready to compete in Springfield. The team enjoyed a team bonding dinner at Lambert’s Cafe on the way down to Springfield. Then, after hosting a surprise baby shower for Coach Bruning, they were up, bright and early ready to compete! Oakville was the last to perform at competition, and brought their A game! After the team routine, the competition moves quickly into two individual categories, where athletes can highlight their best tumbling and jumping skills. 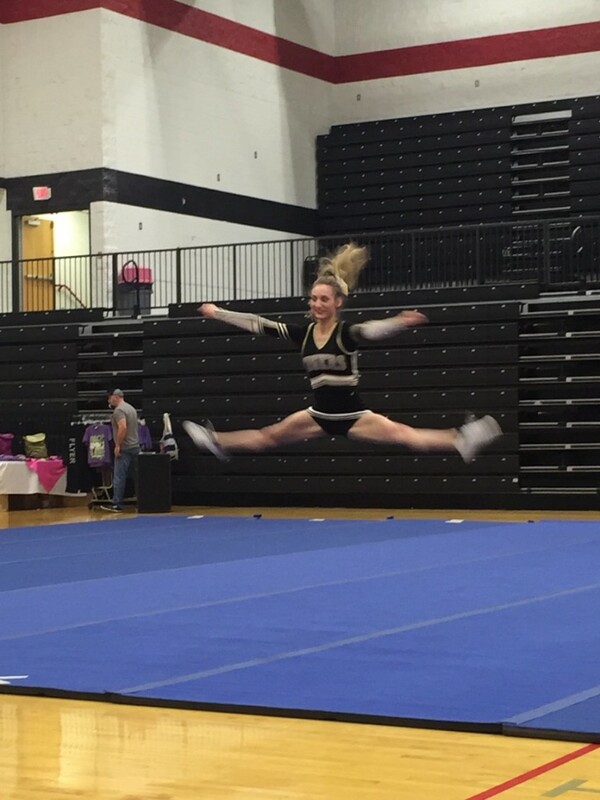 Delaney O’Neill, Savannah Forrester and Lilly Jansberg competed in the Senior Jump category, and Grace Porterfield and Carolyn Ream competed in the Senior Tumble category. 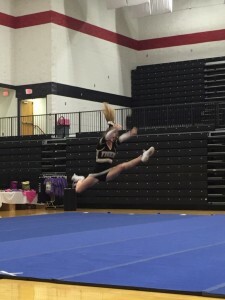 Delaney O’Neill won 1st place overall in the Senior Jump Category. After the individual categories, it was time for awards! Oakville received 1st Place Overall in their division, as well as a Special Judges Award for Best Motions in the entire competition! Before heading back, the girls had another team dinner to celebrate their big win, and close out the end of a great cheer year. 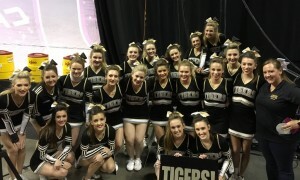 This weekend, it was definitely a great day to be an Oakville Cheerleader! 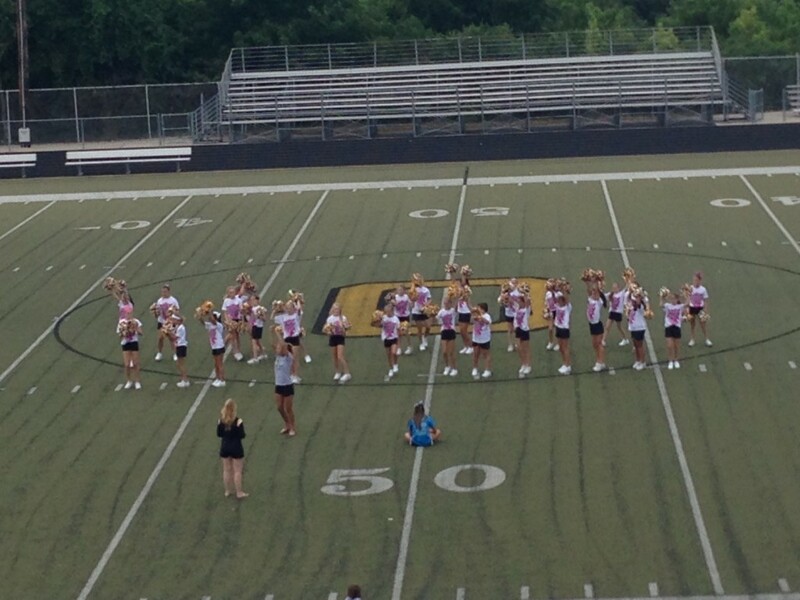 Every summer, Oakville cheerleaders attend a Varsity sponsored cheer camp. The Varsity brand teams up with St. Jude to help raise money to fight childhood cancer and other childhood diseases. While at camp, cheerleaders are asked to participate in a letter writing campaign on behalf of St. Jude. These letters ask for donations for St. Jude’s research and cancer foundation. Although the letter writing campaign is completely voluntary, every year, the Oakville cheerleaders always participate willingly. This past summer, Oakville’s letters generated $1,900 in donations for St. Jude. 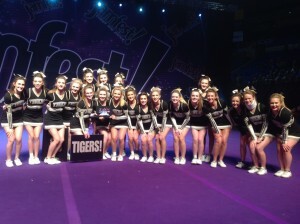 Landing us the #13 spot in the nation of high school cheer teams that have fundraised on behalf of St. Jude. Oakville’s generosity didn’t stop there. Beginning on January 18th, when we were notified that Oakville Cheer was #13 in the nation, we began a second campaign for St. Jude. Since then, we have raised an additional $1,450 for St. Jude. Rather than relying on letter-writing this time, we canvassed the crowd at basketball games and the cheer showcase, asked for donations from students at lunch, and took to social media. The Oakville community truly stepped up and helped us reach our goal. 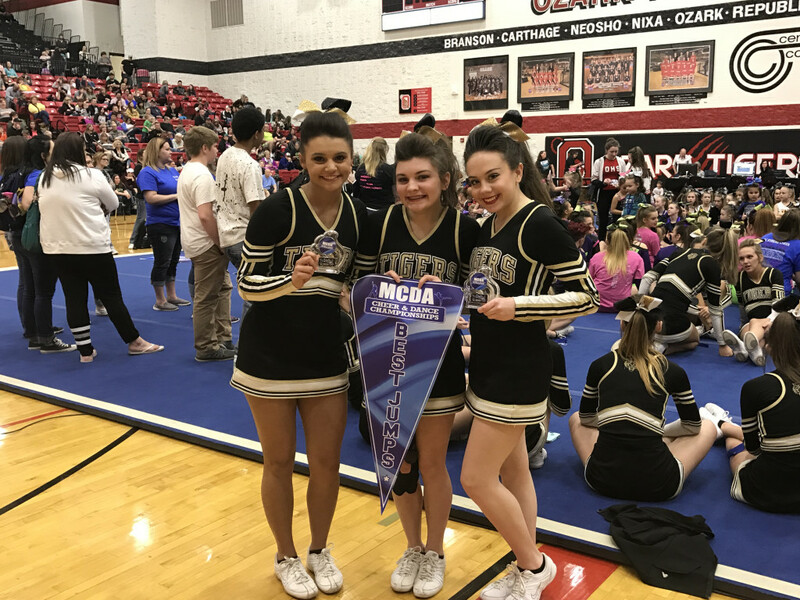 We have now raised a total of $3,350 for St. Jude, making us the #8 cheer program in the nation, and the #1 cheer program in the midwest, to fundraise on behalf of the foundation. Approximately 75 percent of our budgeted costs are covered by public contributions. Your donation counts and will be used to provide breakthrough research and treatment of childhood cancer and other life-threatening diseases. Because St. Jude freely shares the discoveries they make, they’re saving children all over the world. Every child saved at St. Jude means doctors and scientists worldwide can use that knowledge to save thousands more children. St. Jude has treated children from all 50 states and from around the world, and gives specialized training to international healthcare professionals so they can use that knowledge in their own countries. Thanks to donors like you, families never receive a bill from St. Jude for treatment, travel, housing or food — because all a family should worry about is helping their child live. Your support means St. Jude has the freedom to focus on what matters most — saving kids regardless of their financial situation. 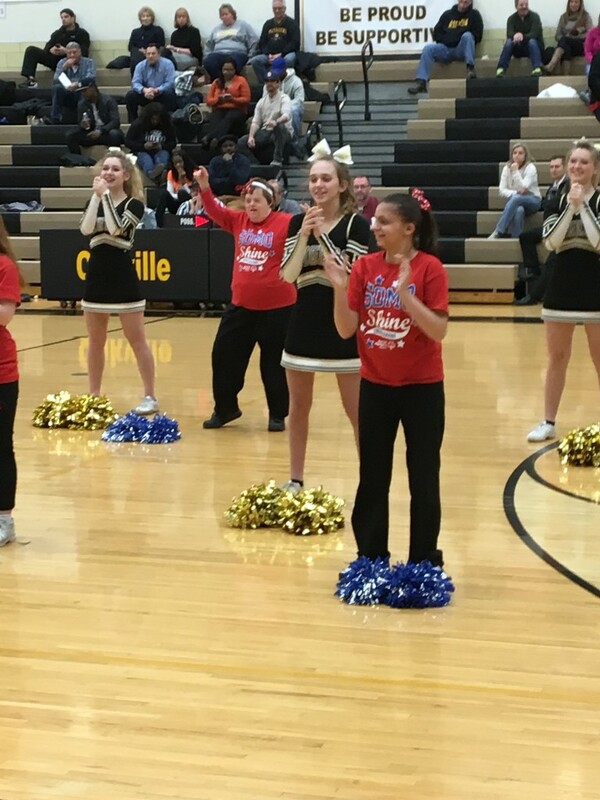 On January 27th, the Oakville Cheer Program packed Gym A with their annual Cheer Showcase, a night dedicated to spotlighting all cheer teams on the Oakville side of the Mehlville School District. 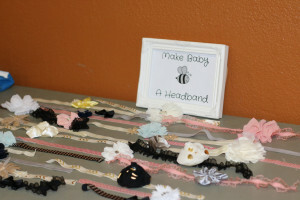 The event serves as a fundraiser to help raise money for upcoming program expenses, such as uniforms, poms and cheer mats. 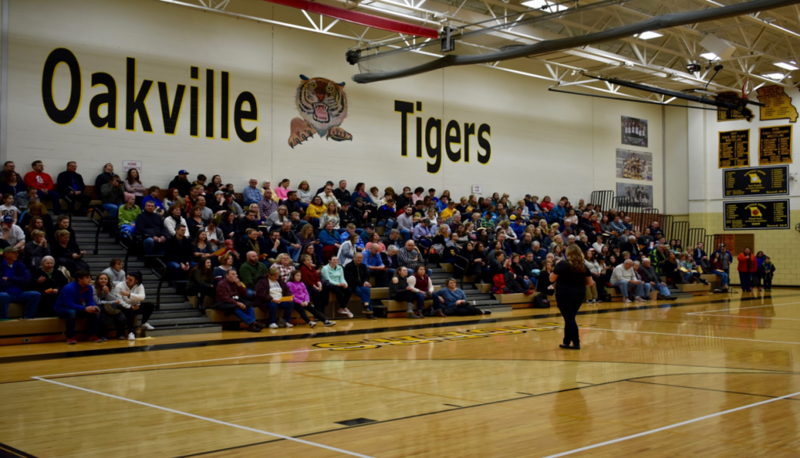 With over 260 audience members in attendance, the program is well on their way to meeting those fundraising goals! 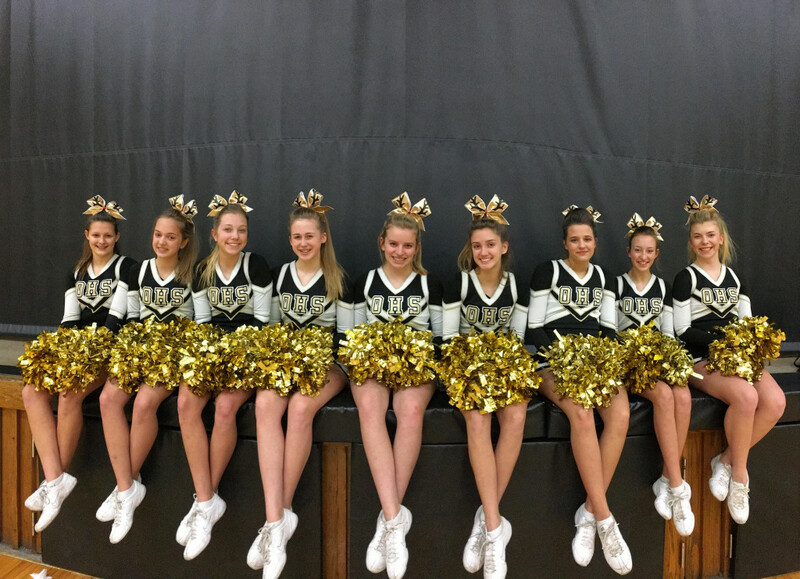 Overall, it was a great night to be an Oakville cheerleader! 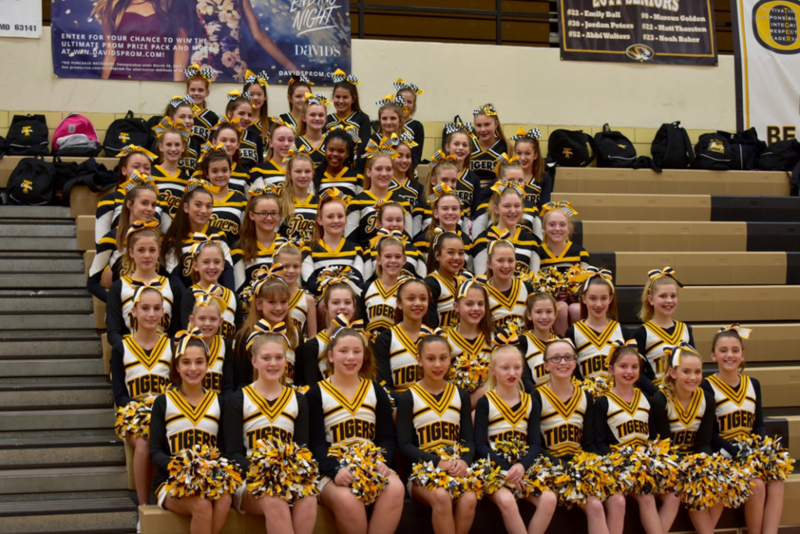 The Jr. Tigers program each performed their pom routines and a cheer. 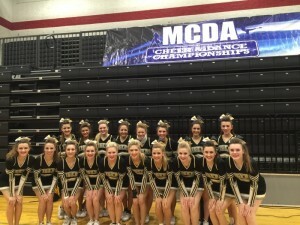 The Freshman team performed three routines. 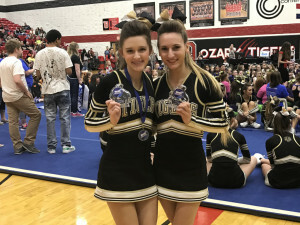 A quarter routine, choreographed by Phoebe Rhodenbeck and Kylie Gaither; a halftime routine, choreographed by Kylie Gaither and Lily Lofton; and their music routine, choreographed by the UCA camp staff and modified by Gabby Michaud and Lauren Belaska. 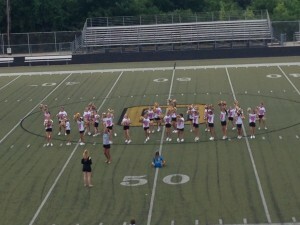 The JV team performed three of their half time performances. Routine A is choreographed by Ashley Durham and Emma Eisenhoffer. Routine B is choreographed by Hannah Jones and McKenna Brawley. Routine C is choreographed by Kara Neinhaus and Ellie Crawford. 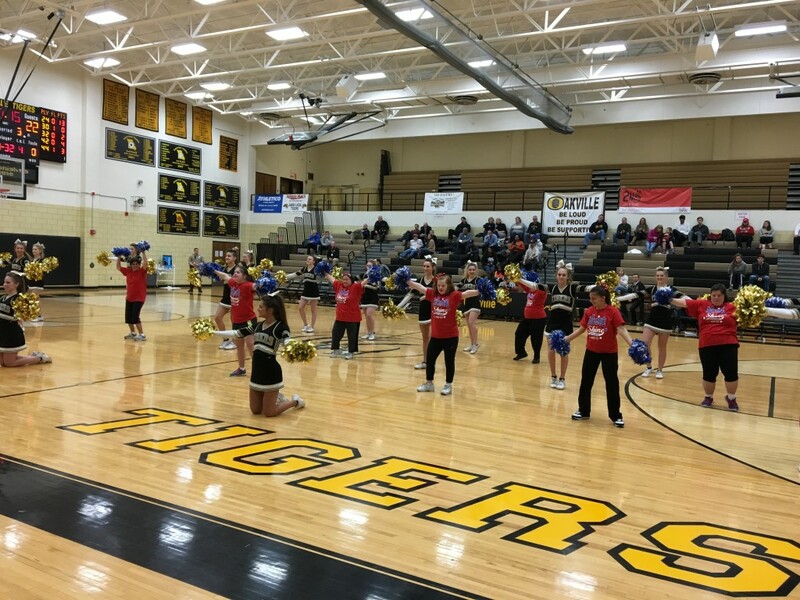 The Varsity cheer team performed four of their halftime performances. The Come and Get it music routine is choreographed by Cassidy Vuylsteke, Lilly Jansberg and Grace Hagood. The Hannah Montana Mix music routine is choreographed by Hanna Oberlander, Ashlyn Jarvis, and Courtney Klemp. 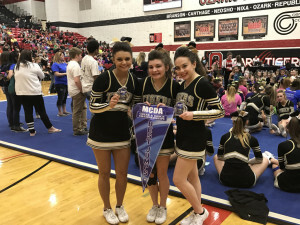 Their OHS, the Team to Beat cheer is choreographed by Savannah Forrester, Sarah Klocke, and Mady Wick. 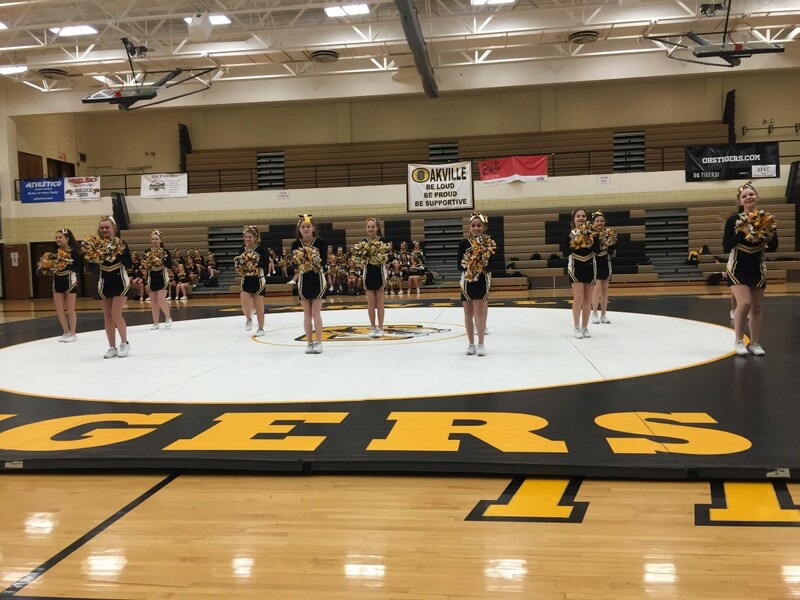 Lastly, they ended the night with a preview of their competition routine, which they will compete with March 3rd at the Midwest Winter Classic Regional Competition in Springfield, Missouri. It was a great night to see all how far the cheerleaders progress from 6th grade to 12th grade while in the cheer program. 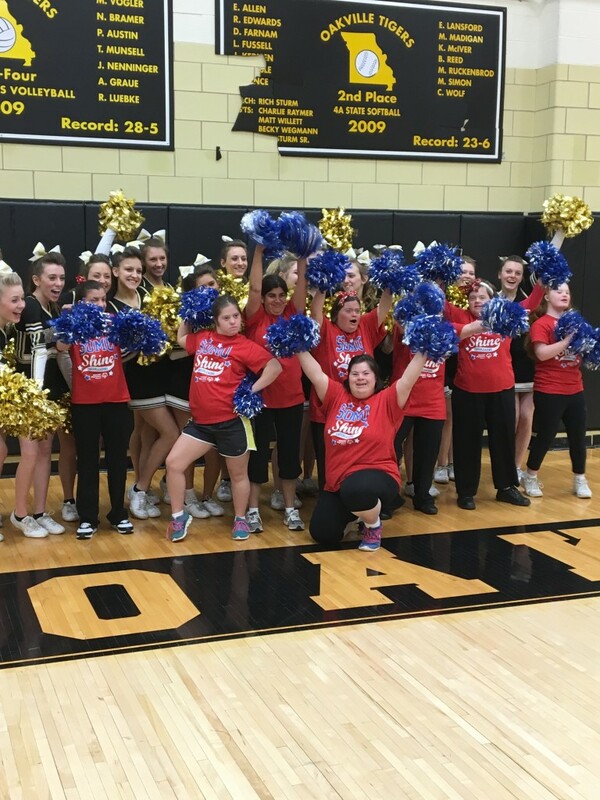 It is wonderful to have the community support we have here at Oakville to foster such a great atmosphere around our cheer and spirit programs. 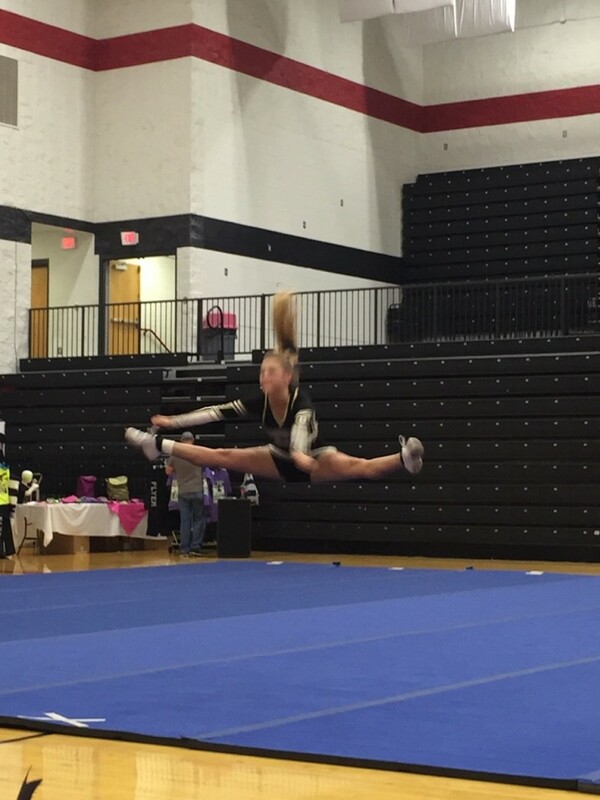 We are looking forward to many more successful Cheer Showcases in the future! 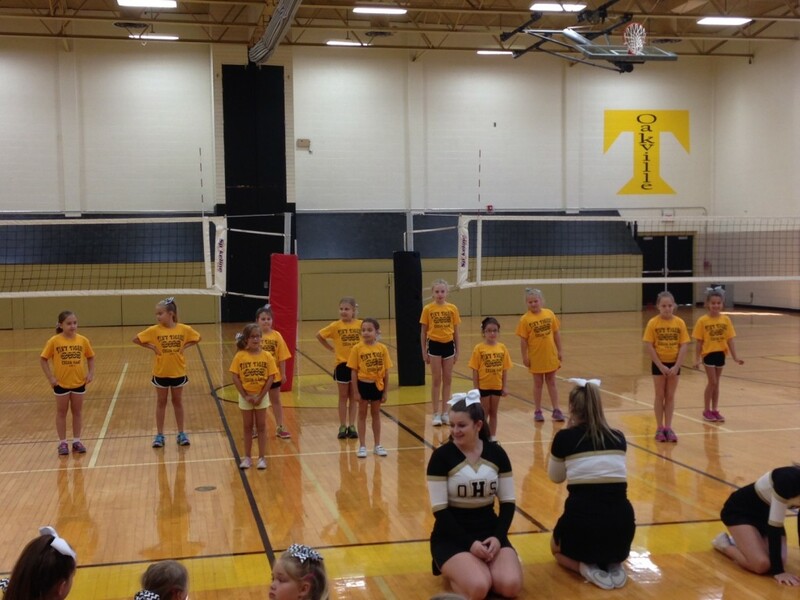 On January 3rd Varsity Cheer hosted 16 Tiny Tiger Cheerleaders, grades K-5, at our Tiny Tigers Clinic. 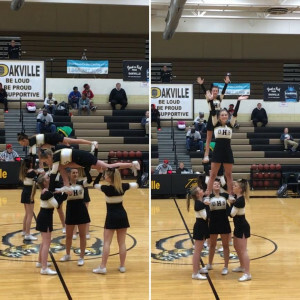 These cheerleaders attended a three hour cheer clinic and then performed in front of a large audience at a Varsity Boys Basketball game later that night. 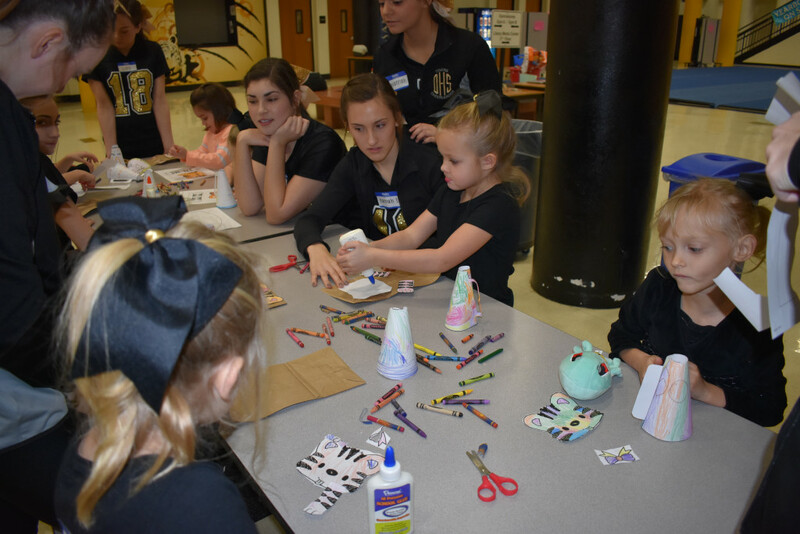 The tiny tigers enjoyed craft time, making tiger puppets, and cheer megaphones, as well as a very competitive round of Cheer Simon Says. 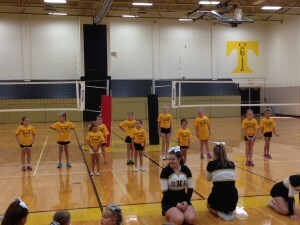 Later on, each age group learned a cheer that they would perform at the basketball game. 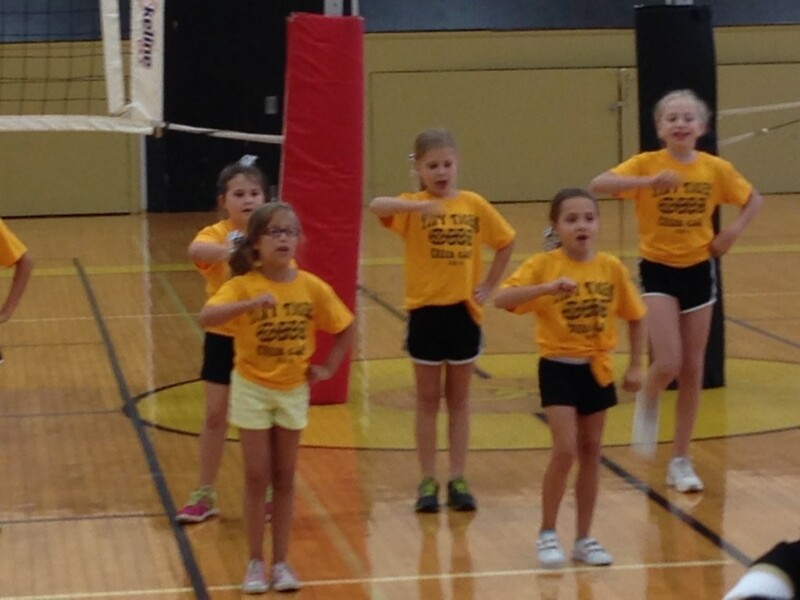 The Tiny Tigers were focused and determined to put on a good show! Later that night they wowed the crowed with their infectious smiles and enthusiasm. Watch for more of our day clinics next school year! Cheerleaders in the Top of the Nation in Supporting St. Jude! Oakville High School is #13 in the NATION of high schools to raise money for St. Jude!! Oakville Cheer has currently raised over $1,900 for St. Jude! At summer camp this season, the Tigers wrote letters to people they believed would help support their campaign for St. Jude and are doing extraordinarily well. Please consider helping their cause! We are hoping to make it into the top 10 schools by February 1st. 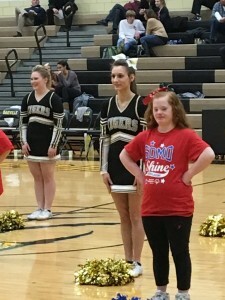 I think this is an amazing opportunity for the cheerleaders to show the community that when they come together, they can create an army of goodness. ​If you are willing, please check out our fundraising page, and consider donating. St. Jude is definitely a wonderful cause. Treatments invented at St. Jude have helped push the overall childhood cancer survival rate from 20 percent to more than 80 percent since it opened more than 50 years ago. We won’t stop until no child dies from cancer. St. Jude Children’s Research Hospital is leading the way the world understands, treats and defeats childhood cancer and other life-threatening diseases. St. Jude freely shares the discoveries it makes, and every child saved at St. Jude means doctors and scientists worldwide can use that knowledge to save thousands more children. Congrats to the Oakville Community for showing our support for such a great organization! 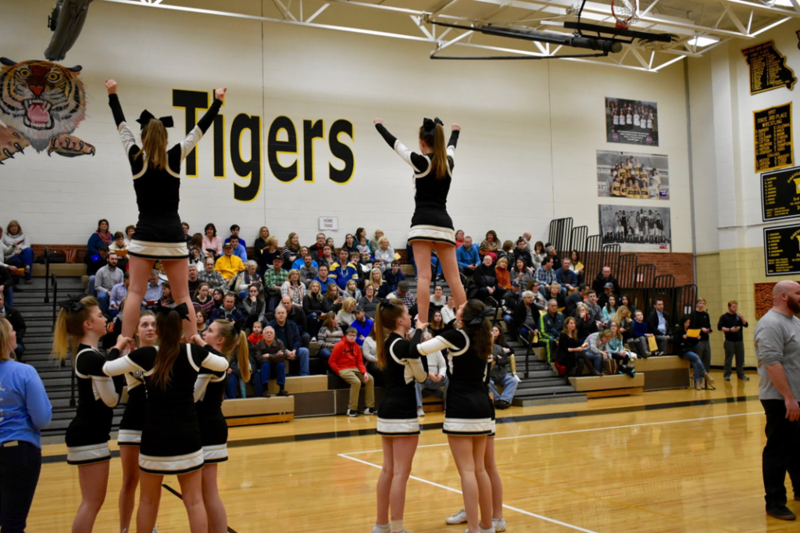 Varsity cheerleading as been keeping busy attending boys home and away games, and girls home basketball games, in between preparing for their own competition season. 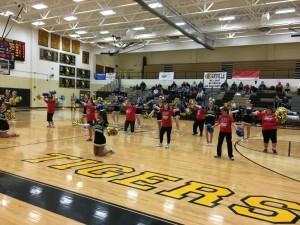 During winter season, the cheerleaders choreograph four music routines to perform during half times at basketball games. 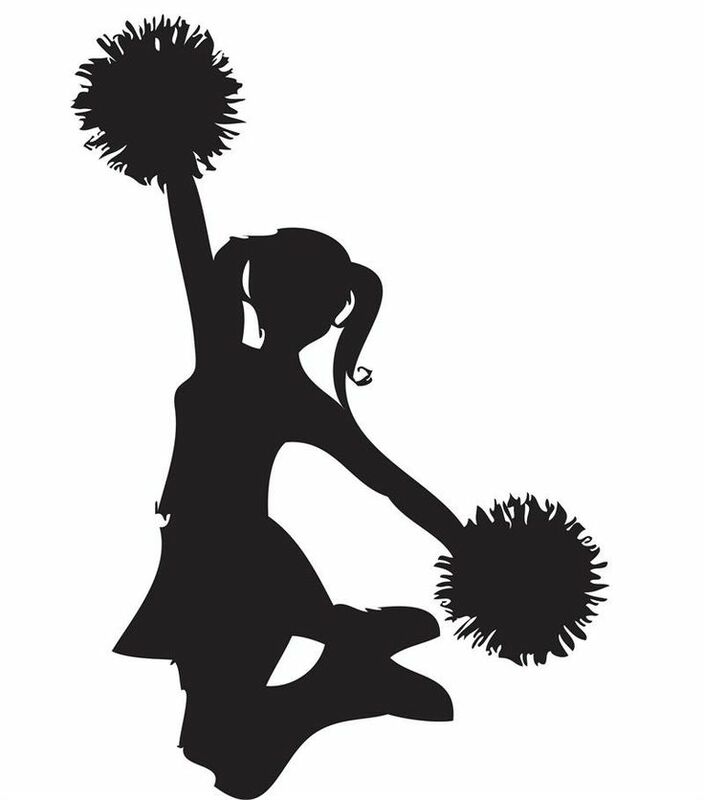 The cheerleaders supplement the remaining games with cheer and stunt performances. 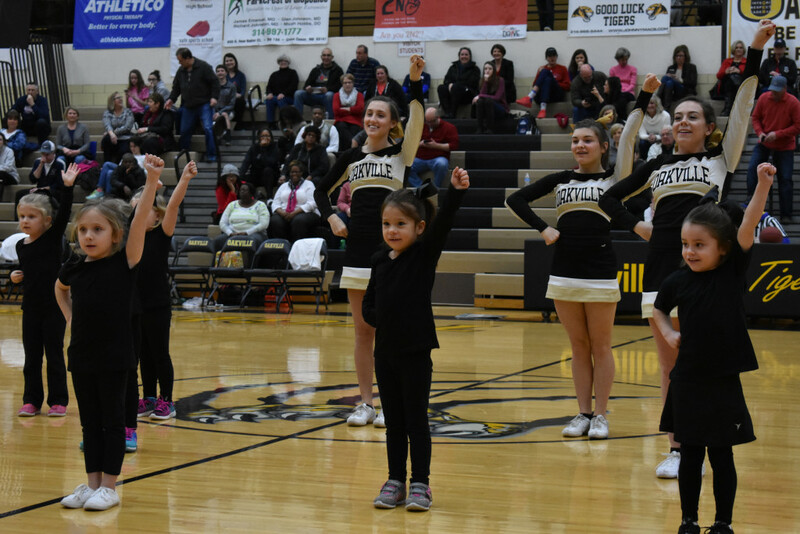 The cheerleaders have also stayed busy hosting a Tiny Tigers clinic, where 16 Tiny Tigers (K-5th graders) joined the cheerleaders January 3rd for a 3 hour cheer clinic, and then performed during halftime at a varsity boys’ game. 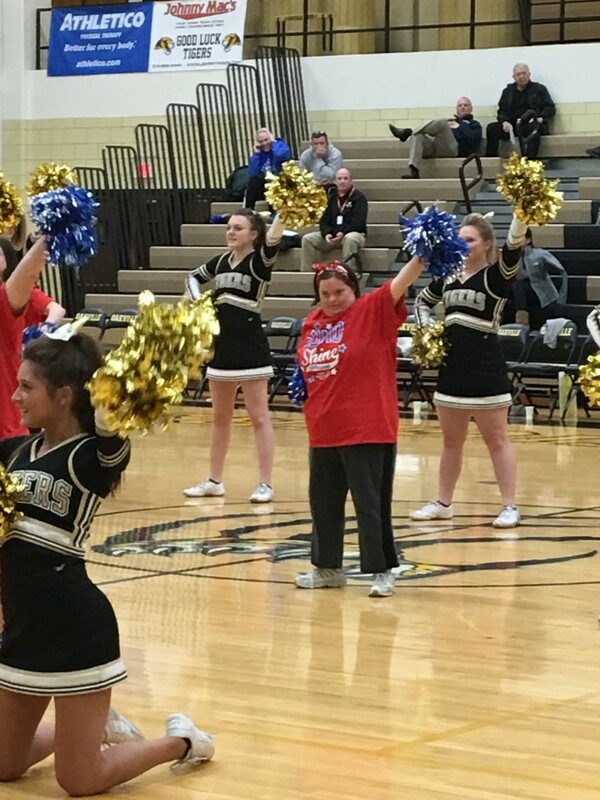 Coming up, the varsity team will host a practice with the Special Olympics SOMO Shine cheerleaders, and share the spotlight with them during the February 14th boys game. For a closer look at what all three levels of the cheer program has been up to this year, come to the Cheer Showcase on January 25th in Gym A. Tickets are $3. All proceeds go to new cheer mats and uniforms. JV Cheerleading has been working hard to prepare for the winter season. 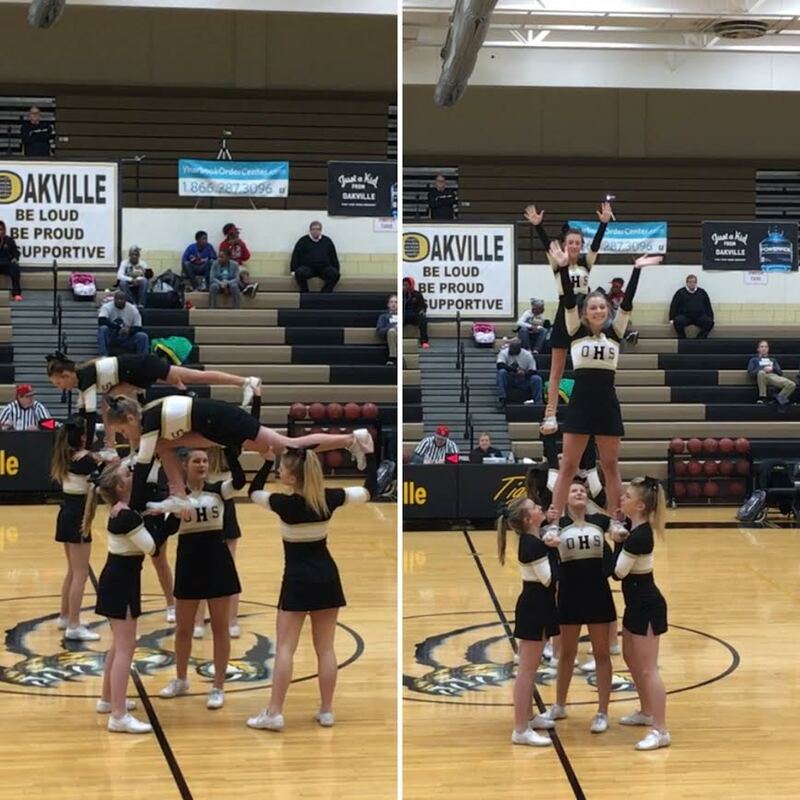 In the fall season, halftime routines are put together by the coach, and cheerleaders focus on performance skills and stunting technique. During the winter season the responsibility is handed over to the cheerleaders as they develop, teach, and perform their own halftime routines. 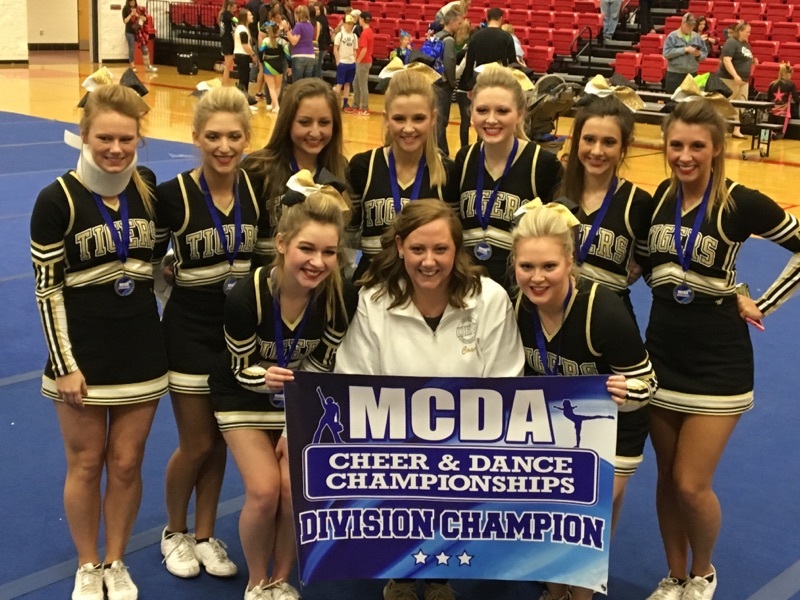 In total, the JV squad will learn five new routines and perform each of them two or three times, being able to improve a routine for each performance. We are looking forward to the new challenges cheering for basketball brings. It’s a different style of sideline cheer and the game progresses at a different pace than the fall sports. 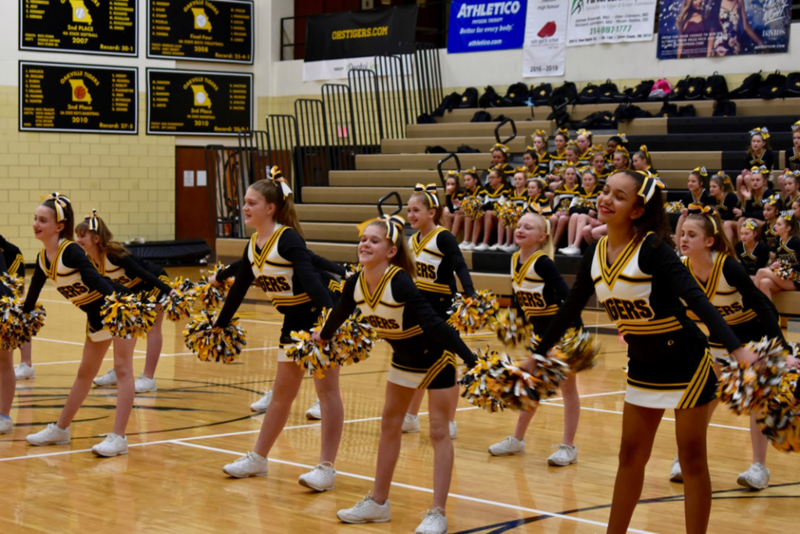 Amid the icy winter weather outside, inside OHS the freshman cheerleaders have been working hard to bring their warm smiles and infectious spirit to everyone in the gym! 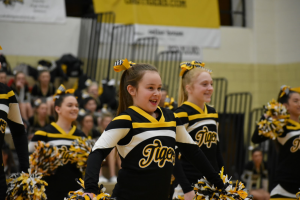 Our main focus this winter season has been to be the best possible sideline cheerleaders we can possibly be by being loud and clear in our cheers, sharp in our motions, and exceptionally cheerful in our demeanor. 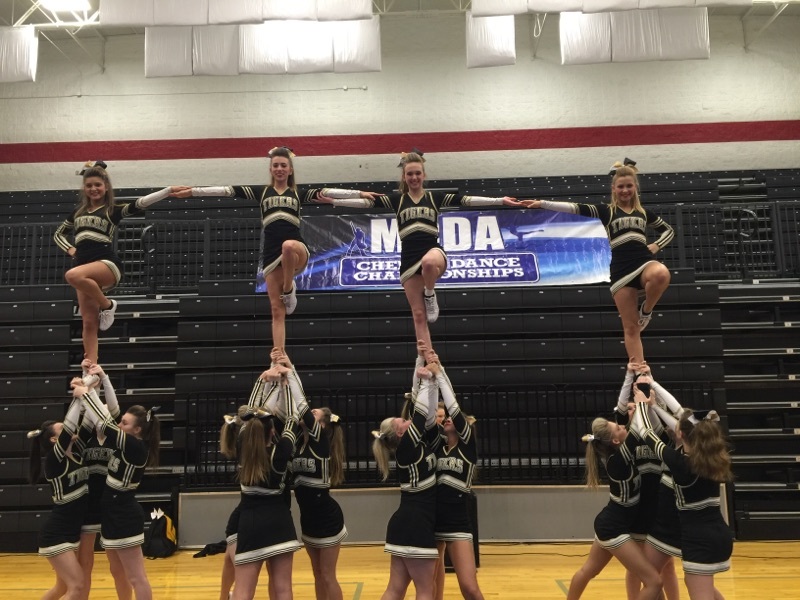 We are extremely proud of our full squad libs that we worked so hard to accomplish this fall. Our primary stunting goal is to strengthen our libs even further in order to pull arabesques among other more advanced flyer skills. Our secondary squad stunting goal is achieve consistent full down cradles. Come see us at the next OHS freshman basketball game! 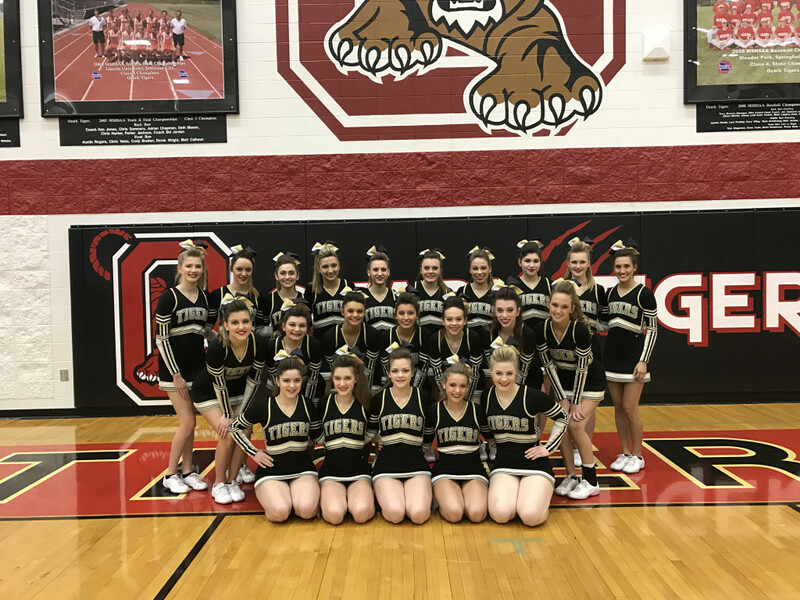 Congratulations to the OHS Varsity Cheerleading Squad on an amazing, rigorous season, and their recent victory at Missouri Cheer and Dance Association’s Winter Classic Regional Championship and strong performance and JAMFest! February 28th, the team went to their first competition, JAMFest: Jam Bash Series St. Louis at the Chaifetz Arenta. Since JAMFest focuses mostly on competitive cheer gyms, Oakville Varsity Cheer competed in the exhibition category. This means the team was scored and given feedback, but not ranked against “All Star,” squads from competitive gyms rather than other high schools. This was a great opportunity to learn how competition works, hear feedback from judges and perform at the Chaifetz Arena in front of a large audience. 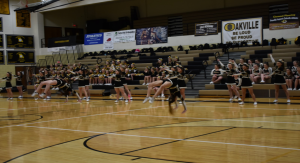 To see the performance, check out the link here: https://www.youtube.com/watch?v=PqyE8caoX3c or visit the OHS Varsity Cheer YouTube Channel. 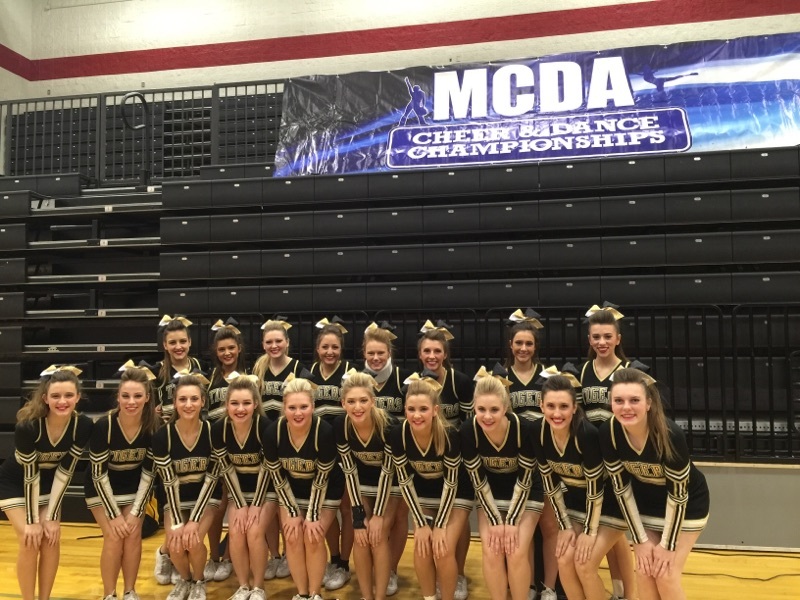 This past weekend, the Varsity Cheer Squad traveled to Springfield, MO for the Missouri Game Spirit Classic 2016, hosted by Midwest Cheer and Dance (MCDA) held at Ozark High School. With hard work and determination, the girls placed 1st in the high school division! 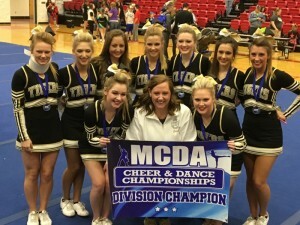 Their routine also received the award for best choreography overall in the competition. You can check out their performance here: https://www.youtube.com/watch?v=SqzIRdsdT-8 or visit the OHS Varsity Cheer YouTube Channel. 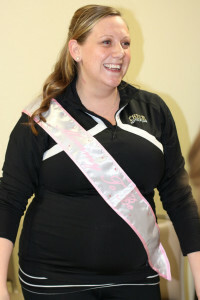 Not only that, but some cheerleaders were recognized individually. 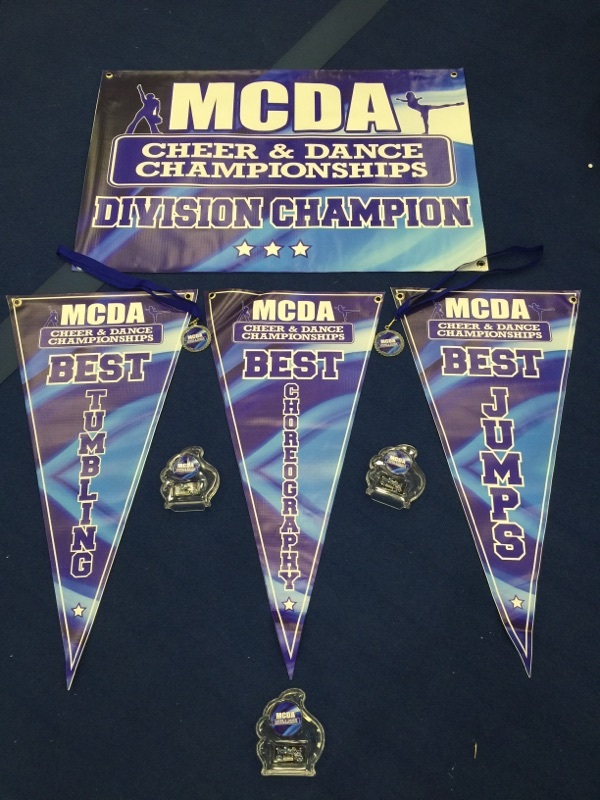 MCDA Competition offers individual categories for talented athletes to shine. In the jump category, athletes are expected to show their best jump, and then also a jump combination (3-5 jumps together, without an additional preparation). 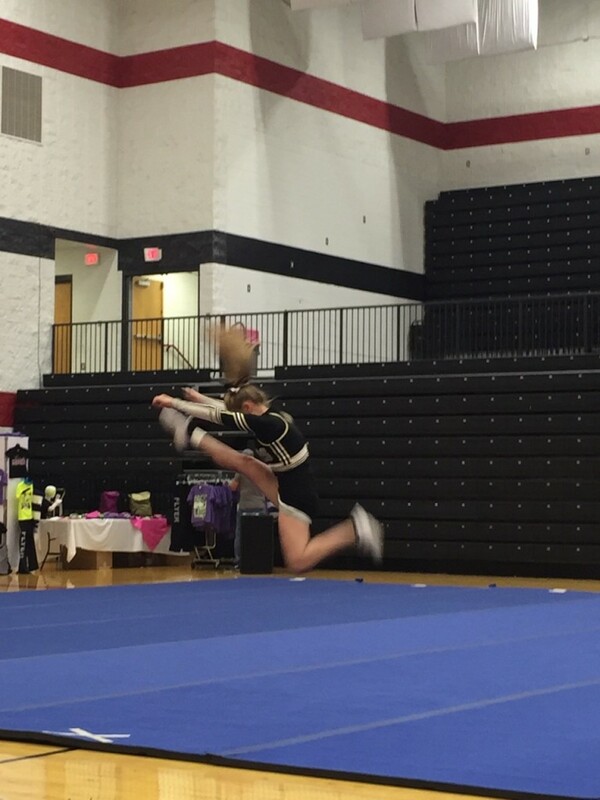 In the tumbling category, athletes showed their best standing tumbling skill, and also a running tumbling pass. Senior, Kassidy Ham, won 1st place for for best jumps in the senior high school division, and senior, Mollie Kohler, received 1st place for her outstanding tumbling also in a senior high school division. 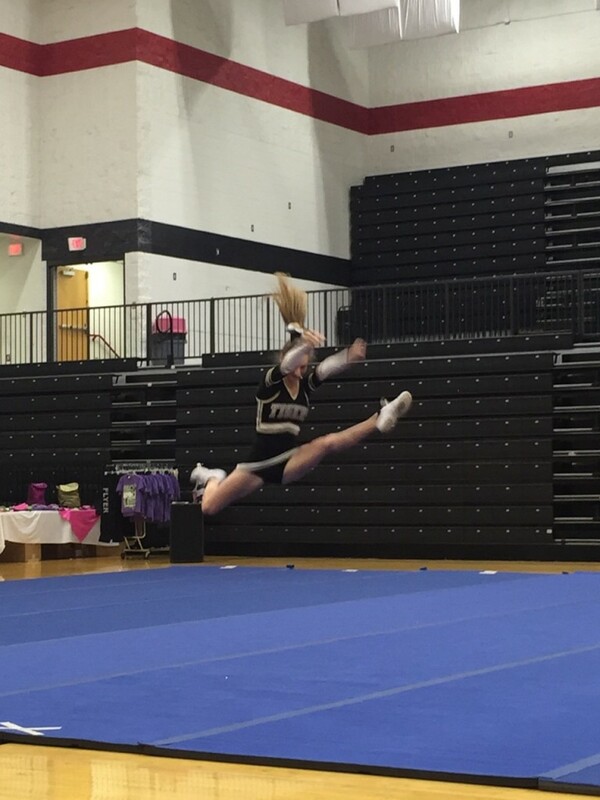 Junior, Carolyn Ream, placed second place for best jumps in the senior high school division. Each individual performance can be seen on the OHS Varsity Cheer YouTube Channel. It was a very exciting time for the girls and we are so excited for not only how far they have come, but how well they’ve represented our school! After competition, the team got together for a celebratory dinner. 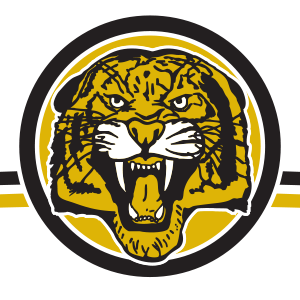 What a great weekend to be an Oakville Tiger! [February 19, 2016] “Through the power of sports, people with intellectual disabilities discover new strengths and abilities, skills and success. 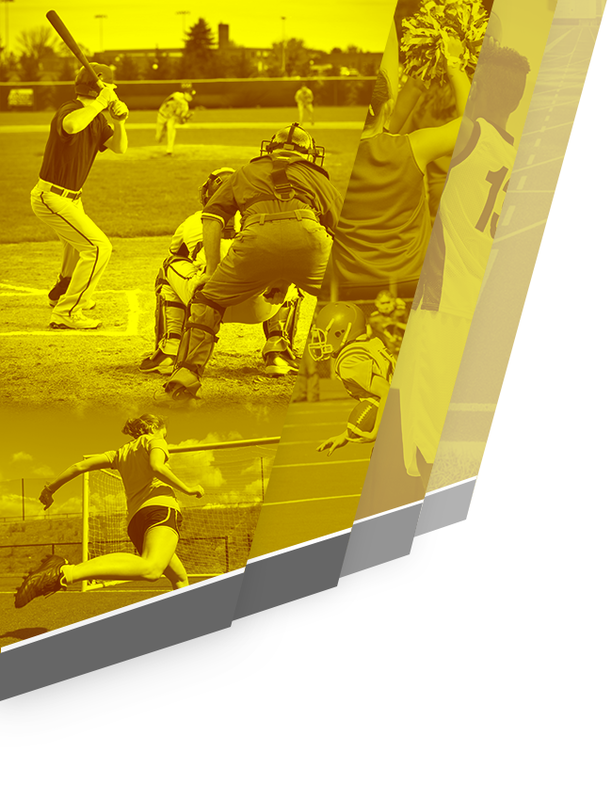 Our athletes find joy, confidence and fulfillment — on the playing field and in life. They also inspire people in their communities and elsewhere to open their hearts to a wider world of human talents and potential. There is no better message to spread than one of love and acceptance. 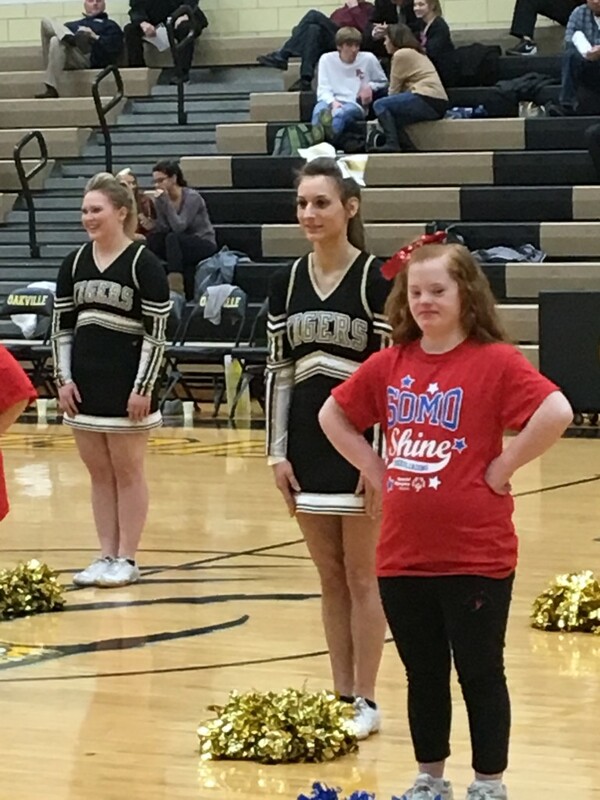 OHS Varsity Cheer was privileged to host Special Olympics of Missouri (SOMO) Shine Cheerleaders to share the halftime spotlight with them at the Boys Basketball game on February 11th. Together, the teams wowed the crowd by performing a cheer and an enthusiastic and uplifting dance. The message of joy and happiness was heard loud and proud through the smiles on all athletes faces and the lyrics in the music. SOMO Shine is a team that Oakville is proud to support, and hopes to continue to support in coming years. 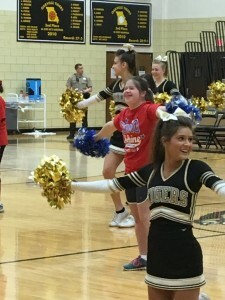 OHS cheer was contacted back in November about helping Special Olympics put on their first ever cheerleading clinic. The workshop was a four hour event. The athletes came and were separated into four age groups. The clinic had about fifty attendees, which was a great turn out. 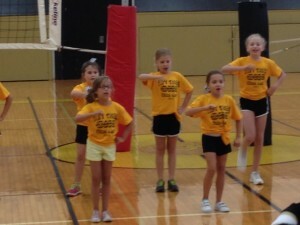 From the athletes that attended the clinic, SOMO Shine cheerleading team was born! 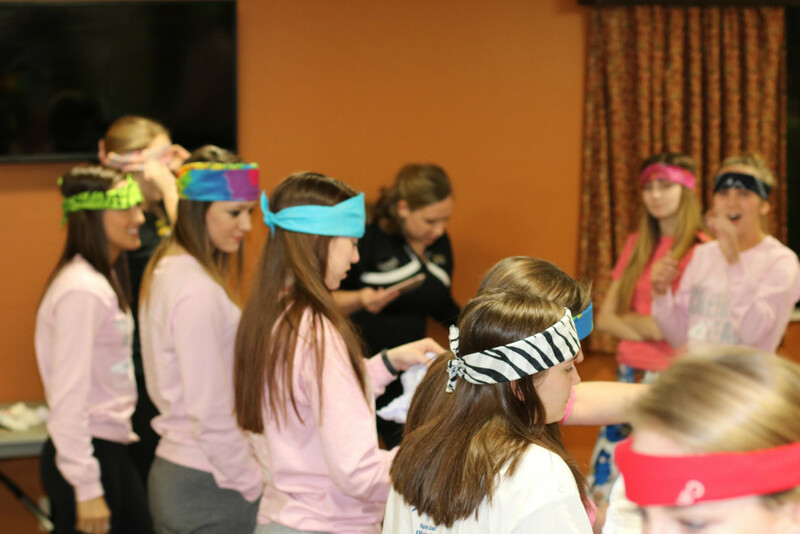 The athletes that loved the experience decided to continue spreading their joy throughout the St. Louis area. They travel to area high schools and perform basketball games. Oakville Varsity Cheerleaders are excited about seeing a few familiar faces in the crowd today as a few athletes will attend the Special Olympics fair at OHS. If you missed the SOMO Shine performance, check it out here! 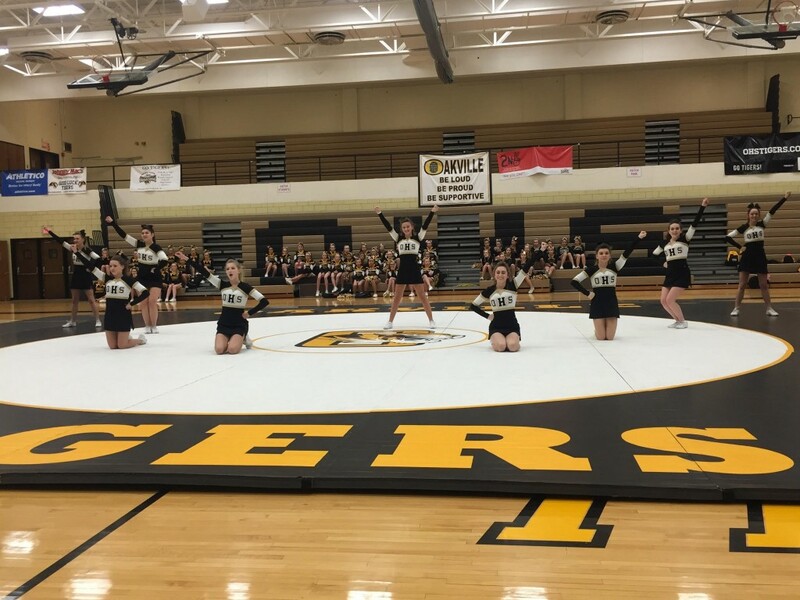 [January 29, 2016] Last night, the Oakville Cheerleaders hosted over 200 fans at the 1st ever Competition Preview Night – The purpose of the night was to celebrate the major accomplishments each cheer team has made throughout the year. As spirit athletes, the cheerleaders typically have to share the spotlight with the football, basketball and soccer athletes. The Competition Preview night gave the girls an opportunity to shine in their own spotlight. 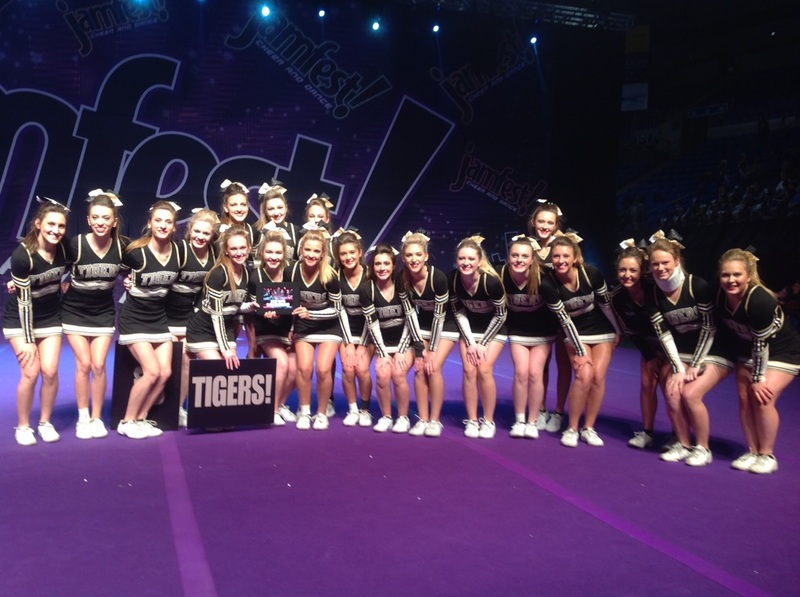 The Jr. Tigers had great performances! Our Jr. Tiger Program currently has great numbers, and it is the hope of the OHS Cheer coaching staff that we keep the Jr. Tigers in the program throughout their future high school experience. 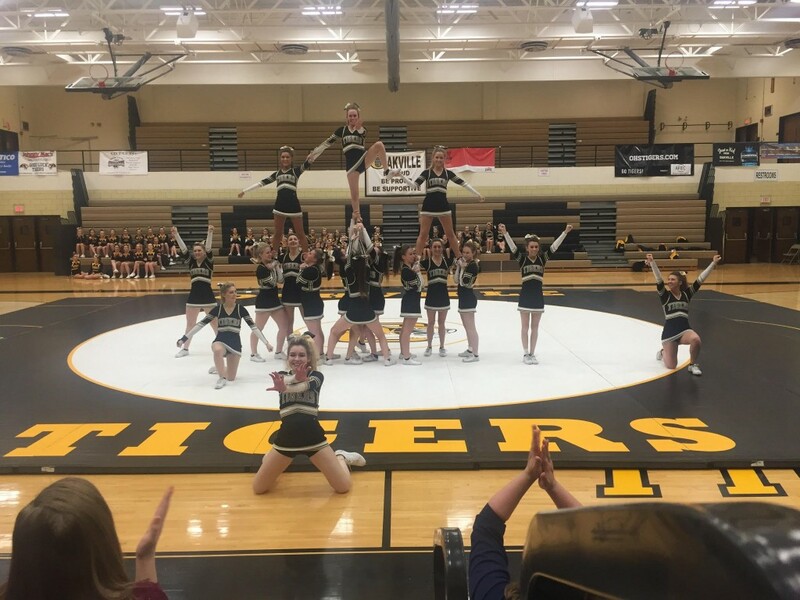 Seeing the dedication, excitement, and great performances all three levels the Jr. Tigers offered, the OHS Cheer program will be in great hands for many years to come! 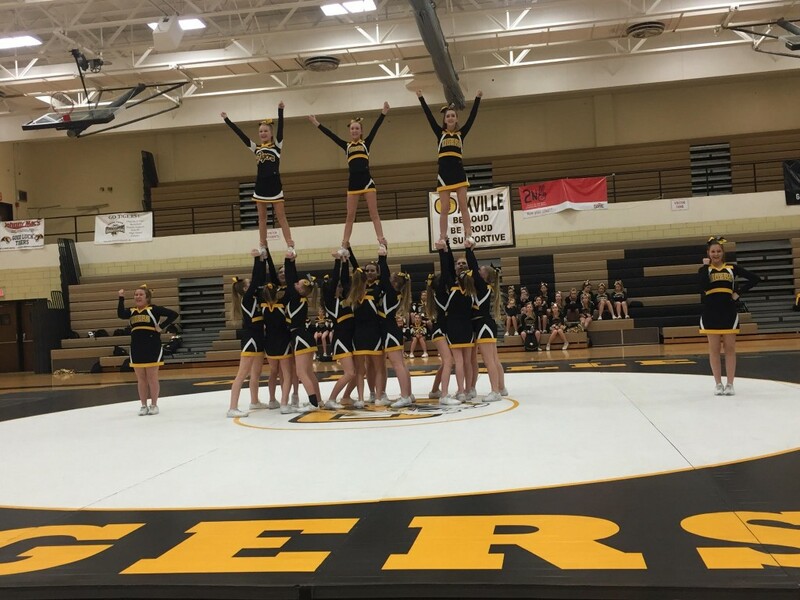 OHS Cheer would like to thank all of those who attended the event. There were over 200 people in the stands! It is so heartwarming to see the community turn out to support the cheerleaders. 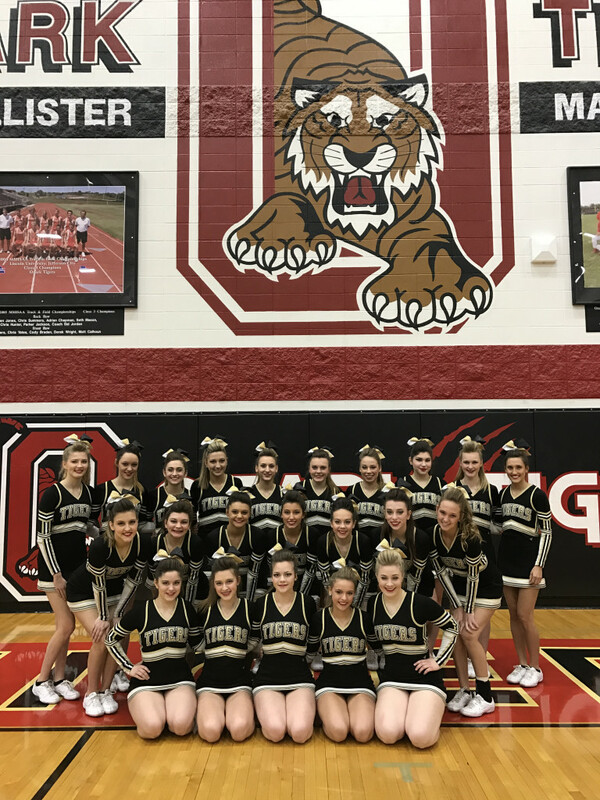 The preview night gave cheerleaders and spectators a chance to see all of the hard work the girls have put in throughout their seasons and spotlight what it really means to be an OHS Cheerleader. The seniors were able to take their moment and share a few of their favorite memories about the program, and the audience was able to give comments about the program as a whole. 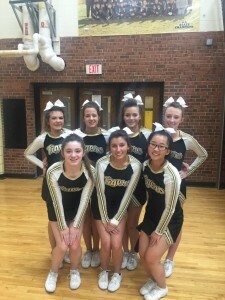 Every day is a good day at OHS, but last night, it was a really great day to be an Oakville Cheerleader. 2014 Summer Camps were a huge success! 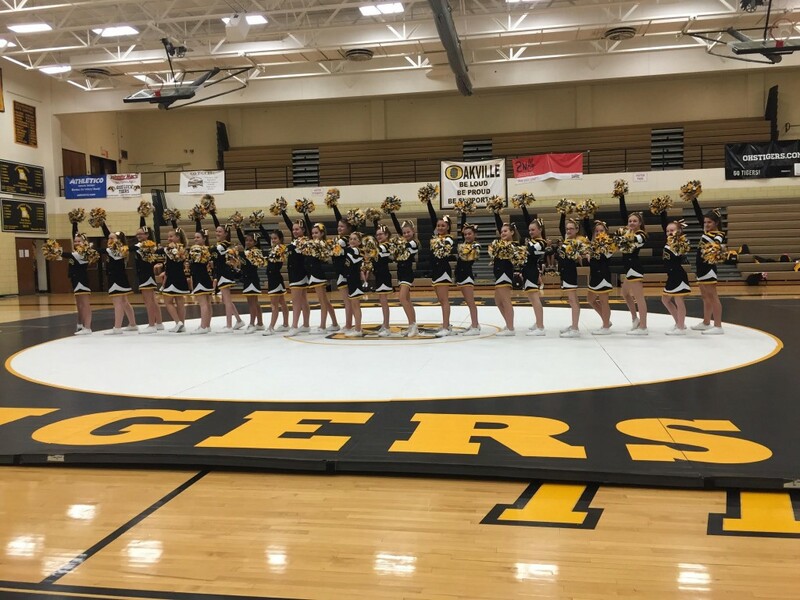 The Varsity Squad hosted the Jr. Tiger Squads (6th, 7th & 8th) in their Summer Camp, taking the skills and routines that they learned at Cheer Camp at Lindenwood and shared with the middle school programs. The week was a huge success! 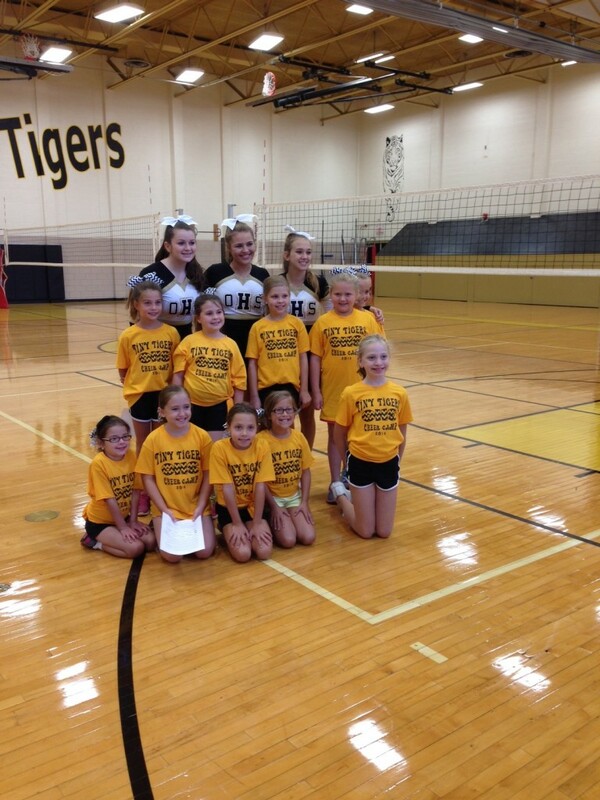 The JV Squad organized and facilitated the Tiny Tigers Camp in mid July! All campers will perform at a Junior Varsity Football game during the fall season (more details to come). All Squad Performance at the Boys Basketball Senior Night was incredible! Check it outHERE! Oakville Cheerleaders looked great at the Winter Pep Assembly! Check out their performance!